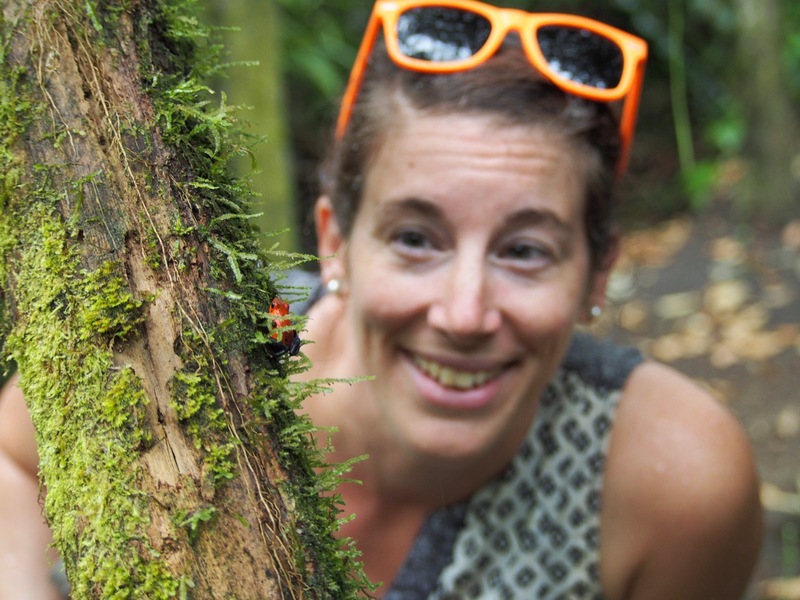 Volcanoes and Cloud Forests – jd – To Infinity & Beyond! 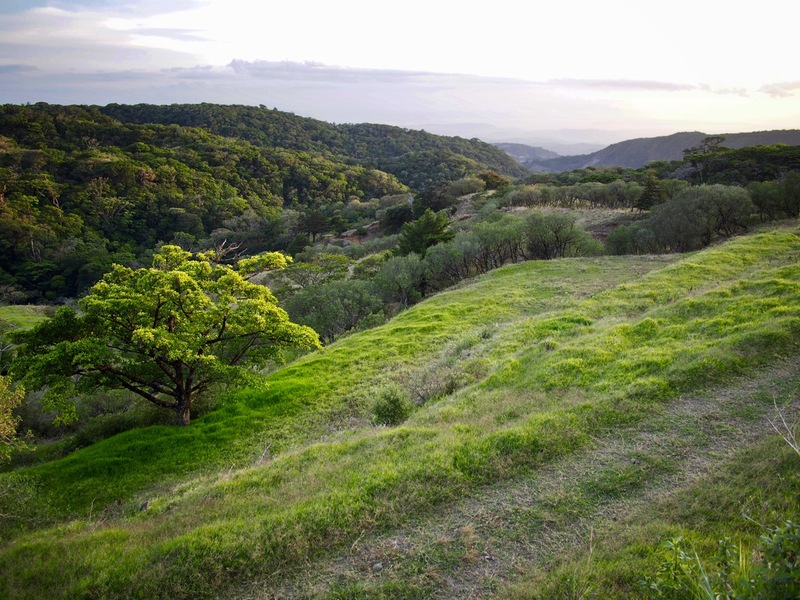 The landscape in Costa Rica is simply amazing. For a country that’s about the size of West Virginia, it has an incredible diversity of scenery as well as an amazing array of flora and fauna to go with it. You could start your day with a hike up a volcano, then visit the cloud forest in the mountains at noon, and still get to the coast in time to watch the sunset on the beach (for the record, I would never recommend driving to all those locations in one day because the roads here are CRAZY, but that’s the subject of a different post). 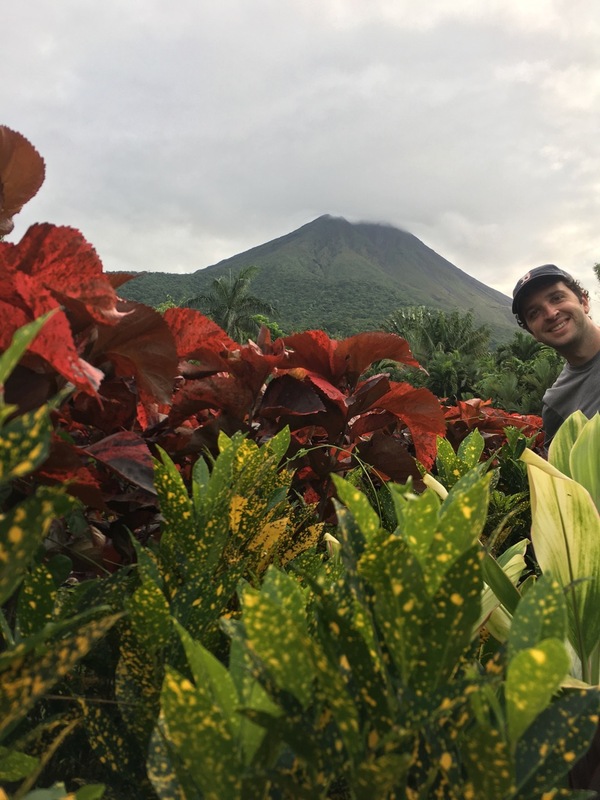 Our first stop after visiting San Jose, the capital city of Costa Rica, was to head north to see the famous Arenal Volcano. It is still an active volcano, but it stopped spewing lava in 2012. For the forty years prior to that its glow would light up the night and its tremors would rumble the nearby towns all day long. It’s worth mentioning that you can only hike about a third of the way up Arenal Volcano. And nearby Chato Volcano is closed entirely to hikers. 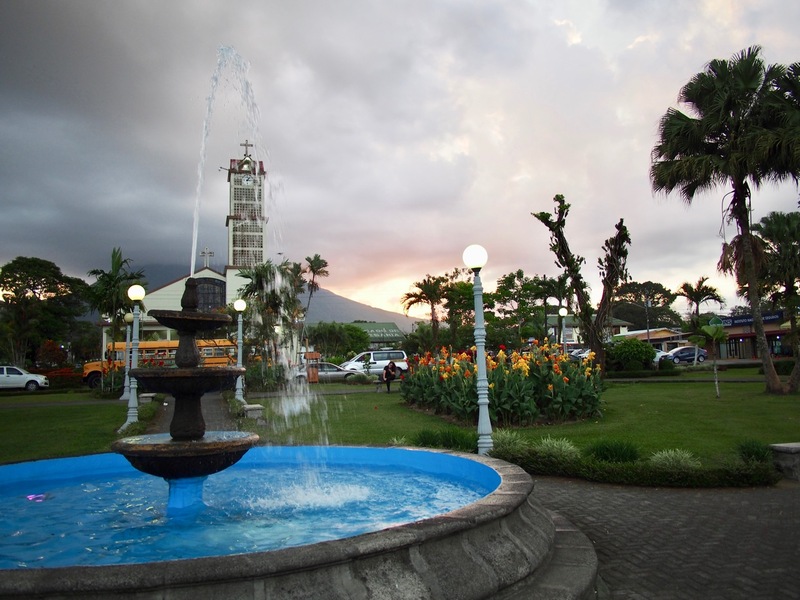 Many people show up in La Fortuna expecting to hike up to the top and look inside, but due to the fact that these are active volcanoes it just isn’t safe or possible to do so. There are many volcanic hot springs in the area that you can visit for a steamy soak in the sulphuric waters. We really enjoyed Baldí Hot Springs which is a spa/waterpark built into the side of a hill. It has 21 thermal pools of different temperatures, a swim-up bar, beautiful landscaping, and even a few waterslides. A word of warning about the waterslides: these are not your safety-first OSHA-compliant gringo waterslides. I got ejected from one of these slides at about Mach III and got spray so far up my nose that I think it came out my eyes. We saw one guy get launched out the fastest waterslide with such velocity that he hydroplaned for 15 feet before being tossed like a rag doll into the deep end of the pool. I mean, it was fun and all, but just be warned! La Fortuna Waterfall. Maybe the crazy waterslides at Baldí were modeled after this? We also hiked to hot springs in the wilderness. It’s very strange to trek through a hot river! 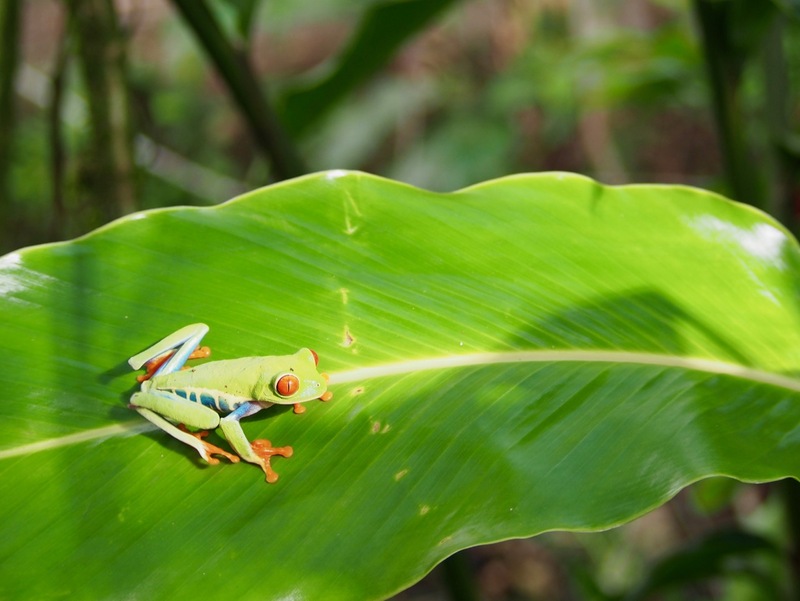 In La Fortuna we also took a wildlife tour at Bogarin Trail. This private reserve is owned by three brothers who have spent the last 25 years reforesting the area (it was originally a cattle farm) and sharing the beautiful flora and fauna with visitors from around the world. They keep their tours very small and intimate unlike most operators in the area. Jenny and I were the only people on our tour and we got to do the entire thing in Spanish (also a rarity given the number of tourists that come through). Besides William’s deep knowledge of local plants, he was able to show us some amazing local animals. 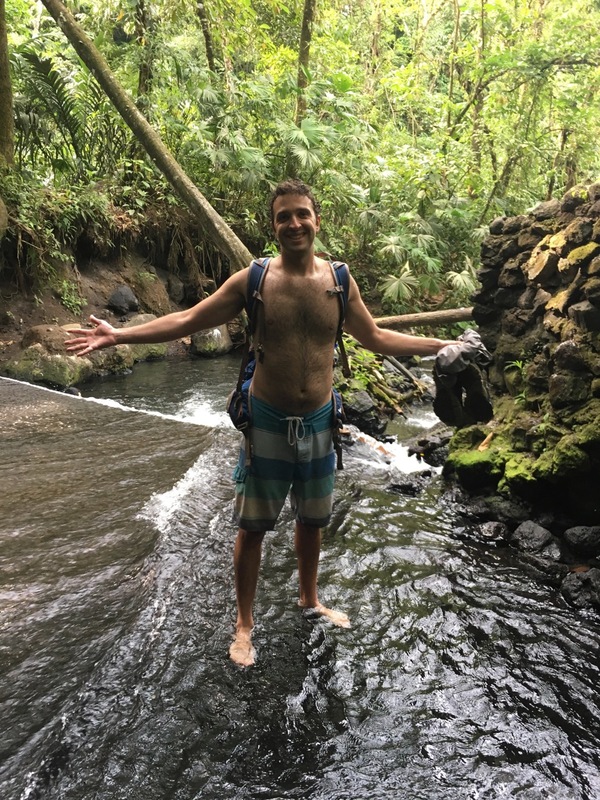 They don’t seem to have a website, so if you want to take a tour with them just stop by the reserve which is right on the edge of La Fortuna. 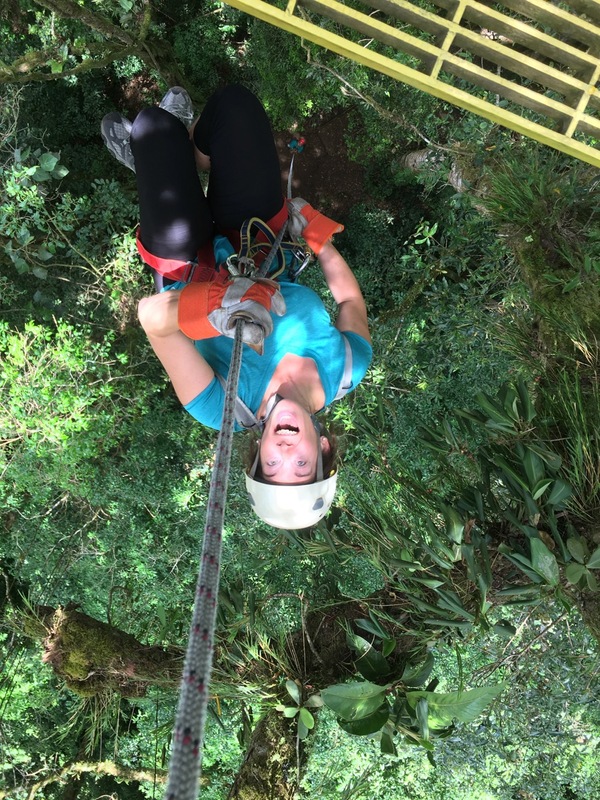 After a few days in La Fortuna, we packed up and took a boat over to Monteverde. As its name implies, this area is high up in a green mountain range. 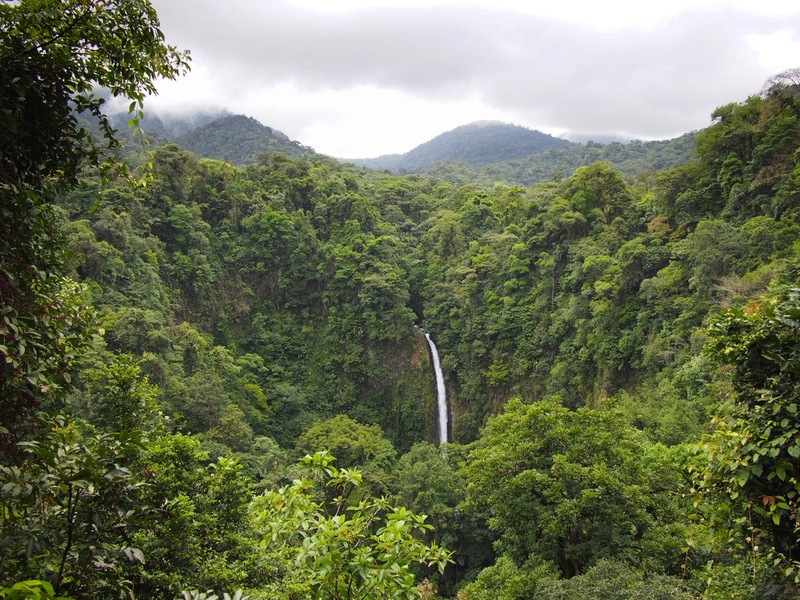 The main attractions here are the two cloud forests, Monteverde and Santa Elena. 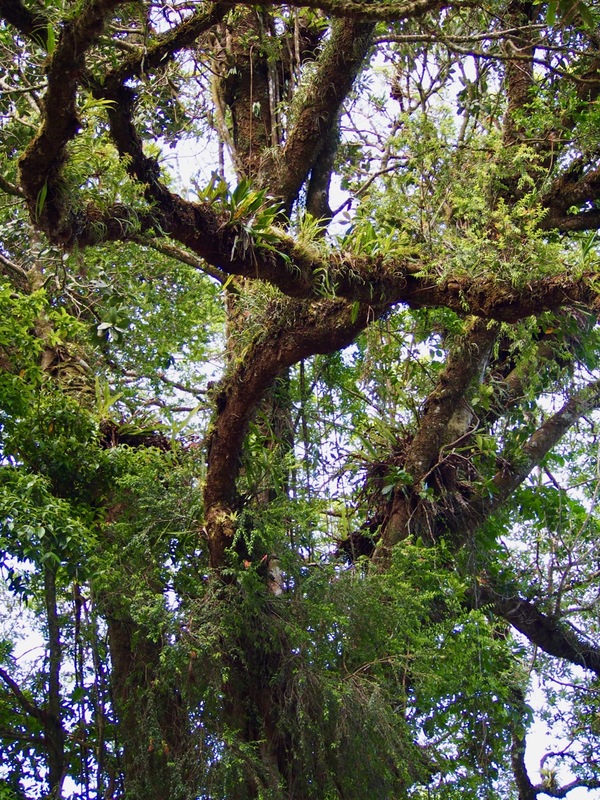 A cloud forest is a really unique climate that is, you guessed it, a forest in the clouds due to its high elevation and weather patterns. This creates a thick jungle home to all kinds of specialized plants and animals such as orchids and bromeliads and many species of birds. We were fortunate enough to be here at the time of year (March and April) that the beautiful Resplendent Quetzal arrives in the cloud forest to make its nest. 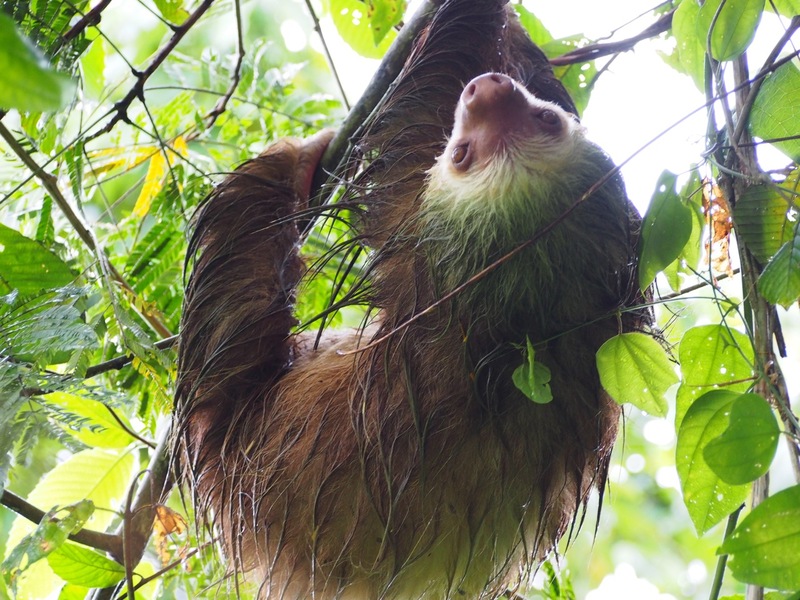 With a stroke of good luck and her uncanny ability to seek out wildlife, Jenny spotted one of them in Santa Elena and we got to watch it for a few minutes. 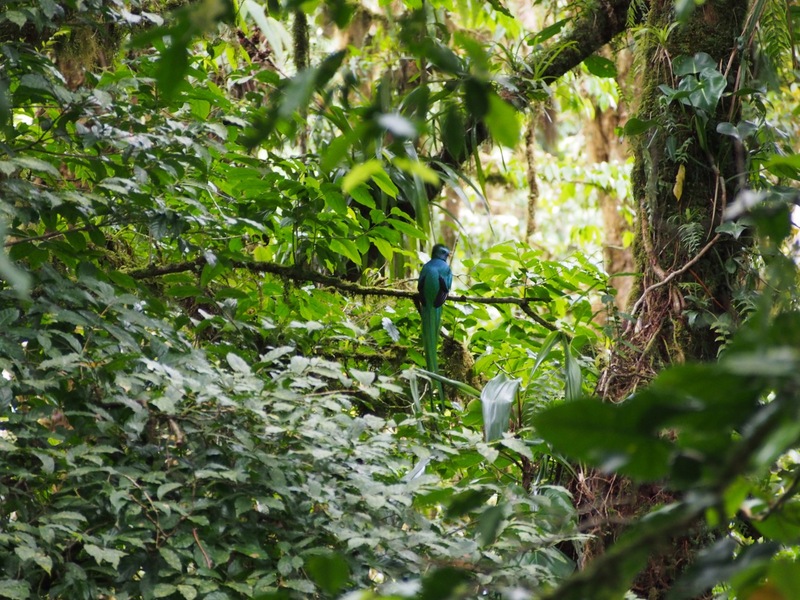 A Resplendent Quetzal in the cloud forest. For more photos, check out our Birds of Costa Rica post! 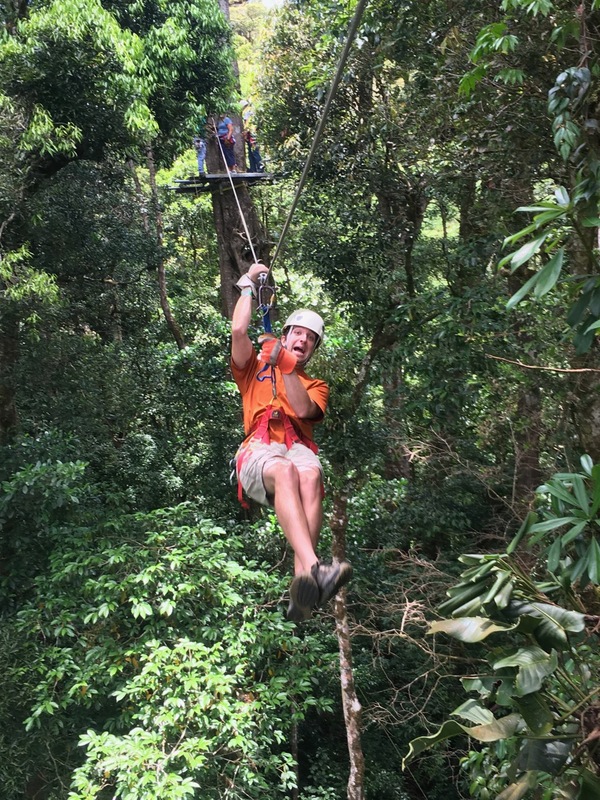 Monteverde is also the birthplace of the jungle zipline, so we had to try that while we were in town. We also took a great nature tour at Curi Cancha Reserve, and we ate a lot of tasty ice cream from the Monteverde Cheese Factory, which was founded by Quakers who left the US in protest of the Korean War. The environment is so rich that plants grow on top of other plants! Overall, La Fortuna and Monteverde were very beautiful and unique places. Unfortunately they’re also the most visited places in the entire country, and so they feel very, very touristy. We spent a lot of time trying to sift through reviews of tour operators and fight off hawkers pushing packaged tours. If you visit this area then we highly recommend the experiences we wrote about in this post (we also took other tours that shall go unnamed and unrecommended). Also keep in mind that there are other volcanoes and cloud forests in the country and we’ll cover those in another post.